Skin tags are hanging growths made up of blood vessels and collagen fibers. It is no wonder that when they get pulled off they have the ability to bleed. In some instances, it may just be a small amount of bleeding from the site where the skin broke when the skin tag was removed or pulled off. Other people may experience profuse bleeding. This can depend on the size of the skin tag and where it is located. Skin tags are attached to the skin and filled with blood. Some skin tags can be removed and have minimal bleeding and be able to be stopped with a cotton ball and band aid and others can bleed excessively and require a towel. Bleeding mainly occurs when a skin tag is cut or pulled off. Abruptly removing the skin tag not only breaks the skin, which causes bleeding, but also blood being fed to the site where the skin tag was. Other removal methods like freezing, ligation, and cauterization don’t cause the same kind of bleeding. Even though cauterization is an immediate removal method it, cautery is used to stop bleeding as the heat seals the wound. There are a few reasons that cutting off a skin tag yourself is not advised. Risk of infection, correct diagnosis and ability to bleed – There are many stories online of people who tried cutting off a skin tag themselves with scissors, nail clippers or just pulling them right off the skin, that were shocked to discover how much it can bleed. Cutting off a skin tag with unsterile instruments in an unsterile environment also opens you up to possible infection. We strongly advise against cutting off skin tags at home. If you have a skin tag that has been pulled, scratched or twisted and is red and irritated, don’t try removing it. If a skin tag has been twisted, it may become thrombosed and change color. Pulling it off may cause excessive bleeding. There is a good chance it may fall off in a few days as once it clots, the blood stops flowing to the skin tag causing it to change color and fall off. If your skin tag changes color or shape but does not fall off within 2 weeks, see your doctor about it. 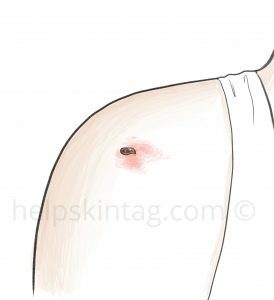 If the skin tag is just red and irritated but hasn’t been twisted, apply some antibiotic cream and cover it with a band-aid. Once it has healed and back to normal, you can safely remove it. If a skin tag gets pulled off or cut while shaving and it starts to bleed, there are a few things you can do to stop the bleeding. For minor bleeds – Hold a cotton ball or clean cloth pressed against the site. Keep applying pressure for 5 – 10 minutes. Check to see if the bleeding has stopped. Apply some antibiotic ointment and cover with a band-aid. Skin tags can bleed when they have been abruptly cut or pulled off. Open wounds from a pulled-off skin tag should at the very least be taken care of with an antibiotic cream. If a skin tag is bleeding, without any simple cause, it should be seen by your dermatologist. It could be a rare sign of something more troublesome. Or, it might not be a skin tag at all.